The duo spent five hours and 58 minutes working on the exterior of the orbiting laboratory to install International Docking Adapter 2 on the Station’s forward docking port to enable future Commercial Crew vehicles to dock to ISS when taking over crew ferry missions in the coming years. IDA-2, transported to the Space Station by the SpaceX Dragon in July, was removed from the spacecraft on Wednesday and placed into contact with Pressurized Mating Adapter 2 early on Friday for the crew to complete the mechanical installation of the 450-Kilogram adapter followed by electrical integration with ISS systems. 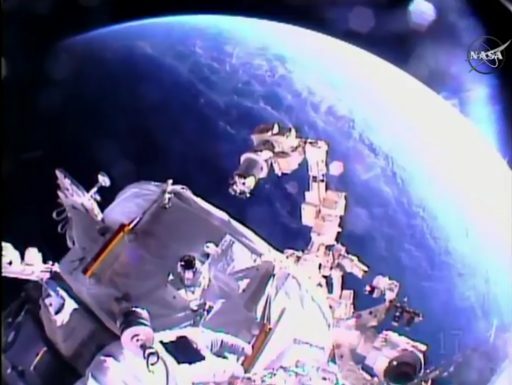 Friday’s successful spacewalk marks a major milestone on the road to the start of Commercial Crew missions of Boeing’s CST-100 Starliner and SpaceX’s Dragon 2 spacecraft, keeping the U.S. Segment staffed until the end of the program in the 2020s. 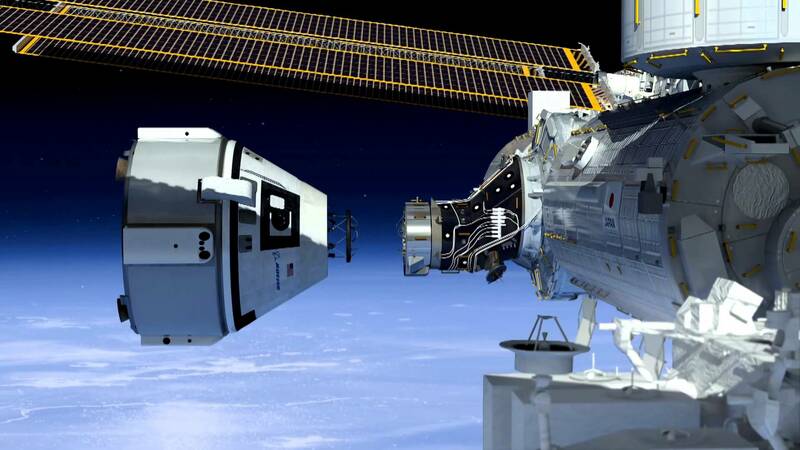 The IDAs are critical pieces of hardware needed to convert the Shuttle-era docking ports of ISS to the International Docking System Standard used by both Commercial Crew vehicles as well as the SNC Dream Chaser that will be part of the Station’s cargo fleet in the 2020s. Two Docking Ports are available on the U.S. Segment of the Space Station via the Pressurized Mating Adapters to be used by crewed vehicles while berthing ports exist using the Common Berthing Mechanisms. Docking ports, while offering a smaller hatch diameter over cargo ports, are used for crewed vehicles because of the need for speedy undocking in the event of an emergency on board the Station. Both Pressurized Mating Adapters (PMAs) comply with the Androgynous Peripheral Attachment System (APAS) used by the now-retired Space Shuttle fleet which represents a Russian design chosen for Shuttle to be compatible with the Mir Space Station. APAS uses a capture ring on the active vehicle that is pushed into the passive APAS to achieve capture and then retract the ring to obtain a pressure-tight hard mate. The International Docking Adapters have been developed on the basis of the Low Impact Docking System (LIDS) conceptualized back in the 1990s and modified after the international community agreed to a common docking standard available freely to any government or private entity that wishes to use it. This will allow any vehicles meeting the standard to link up in space, regardless of their origin. 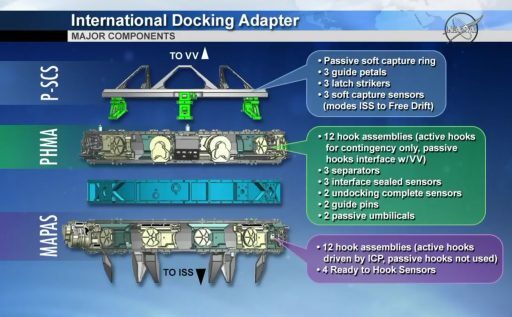 The International Docking Adapters are ring-like structures with APAS-compliant interfaces on their back side and the Boeing-designed Soft Impact Mating Attenuation Concept (SIMAC) on their forward interface. The system consists of a capture ring, guide petals, soft docking magnets, mechanical latches, magnetic striker plates, latch strikers and sensor strikers. The Soft Capture System (SCS) then aligns the two docking rings and through the retraction of SCS, the two Hard Capture Interfaces are positioned within their hard capture range to allow fine alignment by the HCS guide pins. Hooks are then used on either the active, passive or both sides to establish the structural connection between the spacecraft and achieving the required force to press the seals within the docking system against the other spacecraft. Each side includes 12 hooks – the passive and active hooks can both be closed if dictated by vehicle requirements. 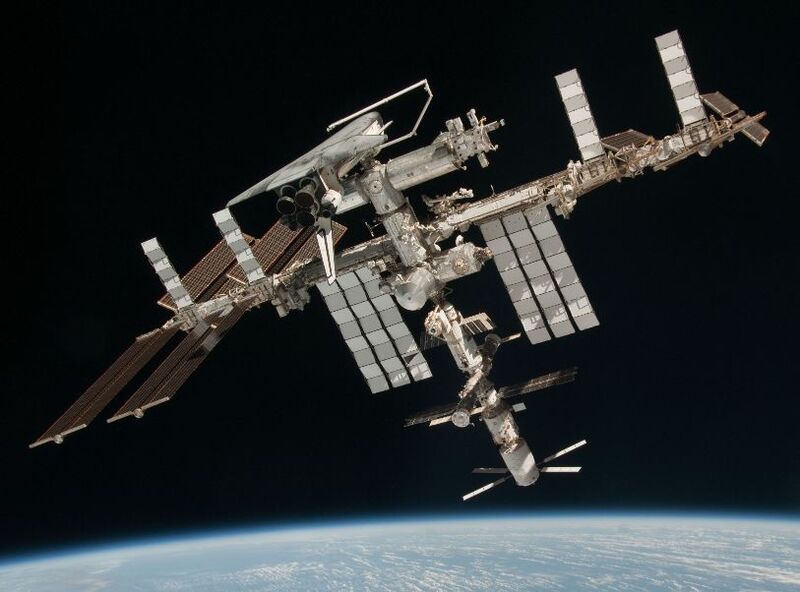 The IDAs also facilitate power transfer capability from ISS to the visiting vehicles as well as STD-1553 and Ethernet connections. A pair of IDAs are to be installed on the Space Station, the first on PMA-2 representing the frontmost docking port of the complex that was used by over 30 Space Shuttle visits. 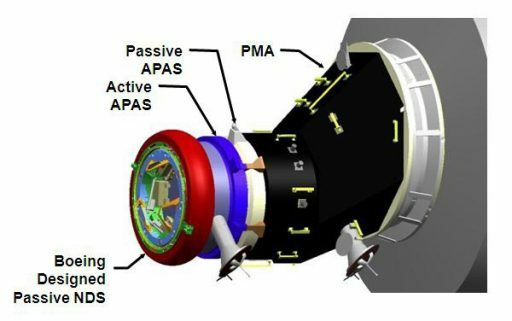 PMA-3 will be relocated from Node 3 to the space-facing side of Node 2 where it will eventually receive IDA-3 that is being built as a spare after the loss of IDA-1 in last year’s Falcon 9 launch failure on the Dragon SpX-7 mission. One IDA is required for the start of Commercial Crew Operations, but two are needed to enable direct handovers between ISS crews which is critical should NASA decide to end its participation in Russian Soyuz launches. IDA-2 was retrieved from Dragon’s trunk Wednesday night in a long shift for ROBO mission controllers who had to deal with a tether getting stuck on a hand rail and requiring a slow and deliberate series of motions by Dextre and Canadarm2 to free up the adapter. Despite the initial hold-up, robotics proceeded to the expected point where IDA-2 was in alignment with PMA-2 at a standoff of around half a meter. Getting up bright and early on Friday, the crew pressed into pre-breathe and suit-up procedures, working very efficiently inside the Quest airlock to remain on the day’s planned timeline. Assisted by JAXA Astronaut Takuya Onishi, Williams and Rubins ingressed their suits and completed a 100-minute In-Suit Light Exercise Pre-Breathe Protocol while their suits were checked out by the team on the ground. 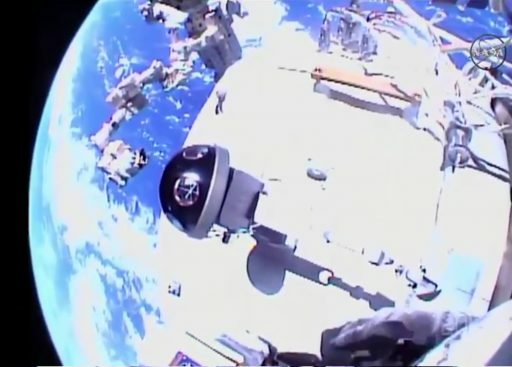 While the crew was getting ready to go outside, ROBO controllers powered up Canadarm2 and Dextre to push IDA-2 in an place the docking adapter in direct contact with PMA-2 to allow the spacewalkers to take control over it from there. Sealed off in the Crew Lock Portion of the Quest Airlock, the crew checked the integrity of their suits while the airlock was taken down to the vacuum of space for the opening of the hatch. EVA-36 formally started at 12:04 UTC when both spacewalkers switched their space suits to battery power ahead of egress for which veteran spacewalker Jeff Williams led the way. 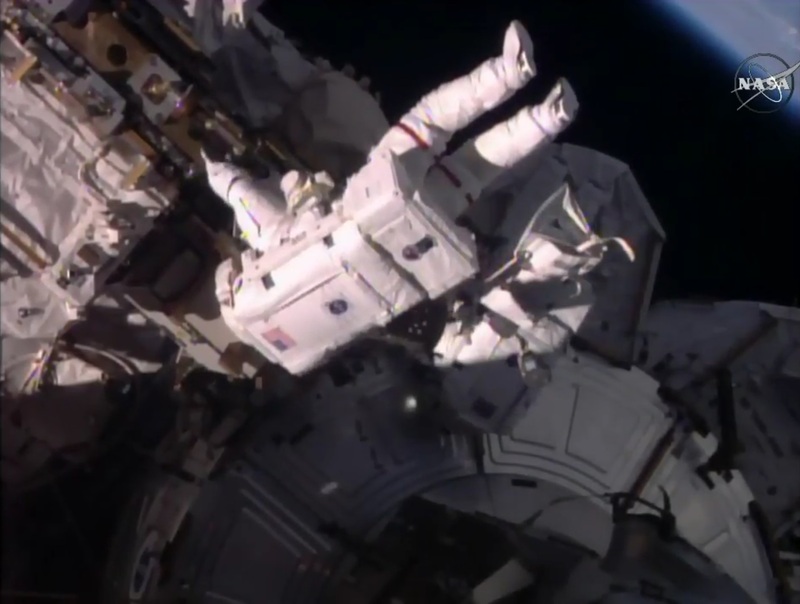 Completing checks of their suits, the two EV crew members quickly started the translation forward to reach PMA-2 – Kate Rubins picked up a foot restraint on her way and Williams stowed a tool bag atop PMA-2 before fetching his foot restraint from the Columbus module. With both crew members in their foot restraints, the first order of business was the attachment of adjustable tethers between IDA-2 and PMA-2 to allow for IDA to be secured in place once Dextre let go of it. With the tethers in place and a clean interface verified between PMA and IDA, the crew gave the all-clear to ungrapple Dextre and move the arm away from the worksite – essentially handing control of IDA off to the crew. When the arm was clear, the crew cinched down the IDA in order to firmly press the MAPAS (Modified APAS) in the backside of IDA to the Passive APAS on PMA-2 in order to allow hooks to engage when driven. 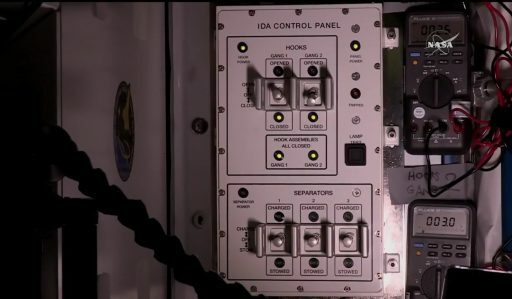 The crew worked together when tightening the tethers and then moved on to connecting IDA-2 to ISS power systems to enable hooks to drive. For the initial connection, Williams who worked port-zenith on IDA removed five connector caps while Rubins demated four caps at her nadir work site. 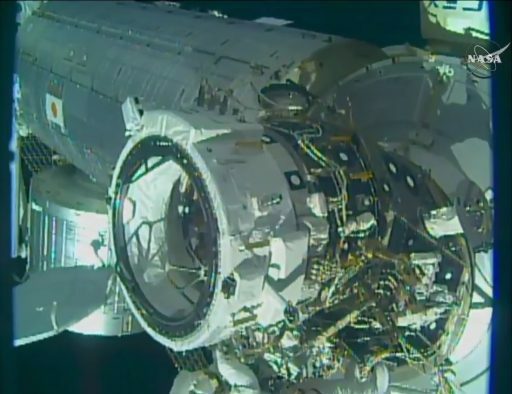 Next was the installation of connectors pre-staged during three EVAs in 2015 and connected to ISS power and control systems to deliver heater power, hook drive power and sensor connectivity to the IDA-2 for the mechanical installation. While Jeff Williams had to deal with a bit of a mess in the cabling, his connectors were cooperative and slid into place without issue. Rubins on the other hand, required help with breaking a stubborn cable-to-cable connection for one of the connectors to then be attached to the IDA patch panel. Williams lend a hand and used leverage to break the balky connection. Some more trouble arose when Mission Control received their first data from IDA-2, showing only one of four ready-to-hook indicators in the correct configuration. For hooks to drive, two requirements needed to be satisfied – structural alignment in the APAS interfaces and direct force on IDA-2 pushing down onto PMA-2. Only with the two cinched tethers in place, the structural contact between IDA and PMA was not sufficient and the crew was instructed to place a third tether. All RTH indicators toggled to GREEN but the celebration of the crew proved to be premature as one of the indicators quickly switched back to RED. A fourth tether brought success in obtaining all GREEN indicators and the crew moved away from the worksite to ensure PMA-2 would be as still as possible during the hook driving. Inside ISS, Takuya Onishi was manning the IDA Control Panel from where he sent the command to drive the first set of six hooks on the MAPAS in order to accomplish the mechanical connection. It took four minutes and 30 seconds for all hooks to close, clearing the crew to resume work while the second set of hooks closed. Teams were glad to report to the crew that all 12 hooks had closed and IDA-2 had finished its structural installation. With the mechanical installation of IDA-2 complete, Williams and Rubins had plenty of work in store. They worked efficiently to place a pair of bags over two hemispherical reflectors on the PMA-2 module that were used during the Space Shuttle rendezvous and are now obsolete and are covered to avoid confusing future visiting vehicles on approach to ISS. A cover was also placed over the H-Fixture that was used by Dextre to handle the IDA. 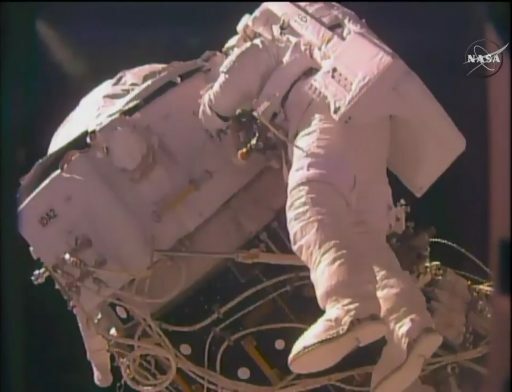 Next, the spacewalkers removed the power and data cables installed earlier since the MAPAS hooks will never be used again – allowing their cables to be used to supply power to the International Docking System and the ISS-to-Visiting Vehicle power transfer system. 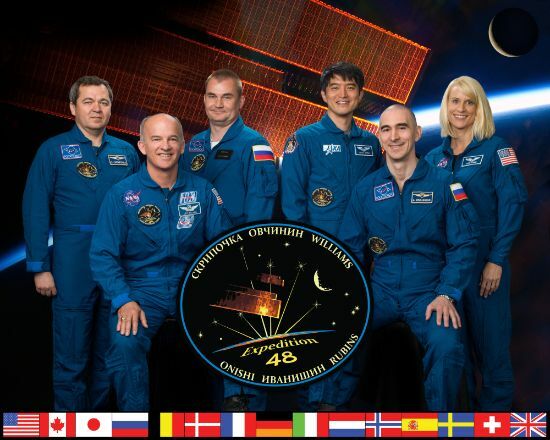 Also, the crew mated Ethernet data cables to provide connectivity between ISS and visiting vehicles – placing a total of ten connections to the IDA-2 patch panels to achieve the permanent configuration for VV arrivals. To close out their work at IDA-2, the two crew members worked together to remove a thermal cover from the forward docking port on the IDA followed by the installation of a pair of laser retroreflectors on the sides of the adapter to guide visiting vehicles to a smooth docking. With these tasks completed, the spacewalkers left IDA-2 behind after a job well done. The final tasks of the EVA were some tedious cable routing activities – Jeff Williams moved to the infamous ‘rats nest’ in the Lab/Node1/Z1 area where he picked up a cable and routed it around the Z1 tray for a future EVA. Rubins retrieved a cable on the US Lab and routed it forward to be pre-staged at Node 2 zenith to ultimately deliver MDM Ethernet data to visiting vehicles docked to IDA-3. 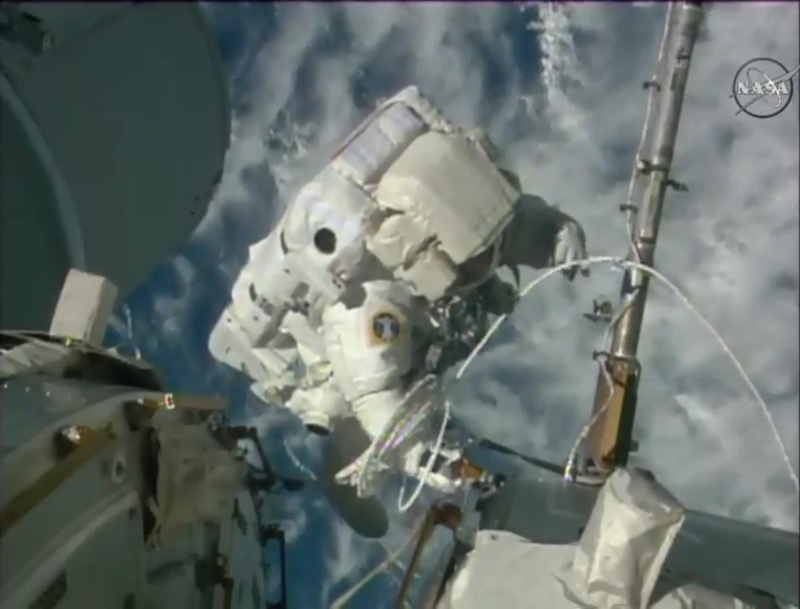 All primary tasks of EVA-36 had been complete by PET+5 hours and 15 minutes, allowing the spacewalkers to press ahead with the two get-ahead tasks outlined for this EVA. However, Williams noted a degrading communications system with audio dropping out in his right ear. In an exercise of caution, Mission Control decided to forego any additional tasks and have the crew return to the airlock. 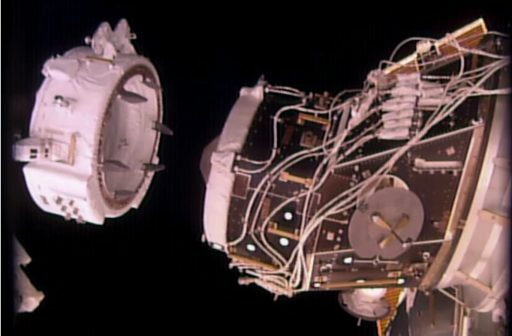 Heading back inside, the crew members hooked up their suits to onboard power and cooling ahead of closing the hatch and initiating the repressurization of the airlock at 18:02 UTC – marking the official end of the EVA. 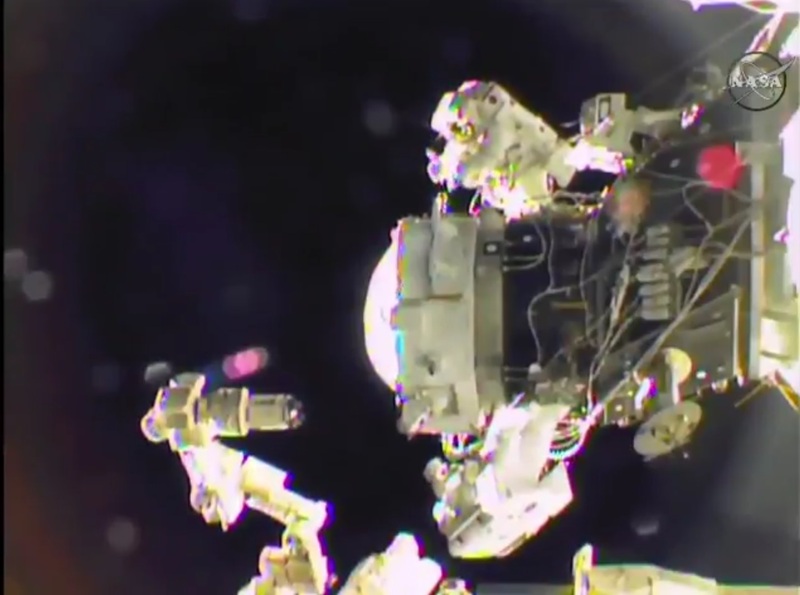 Friday’s EVA marked the 194th spacewalk dedicated to ISS Assembly and Maintenance for a total of 1,210 hours and 46 minutes. 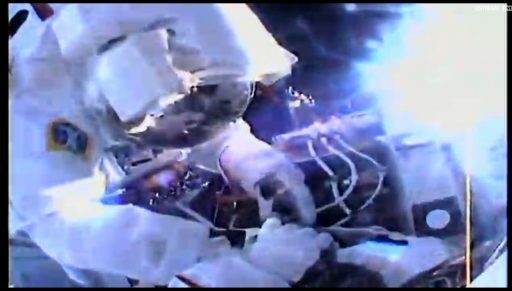 It was the fourth EVA for Jeff Williams who now has a total of 25 hours and 7 minutes of spacewalking time under his belt. 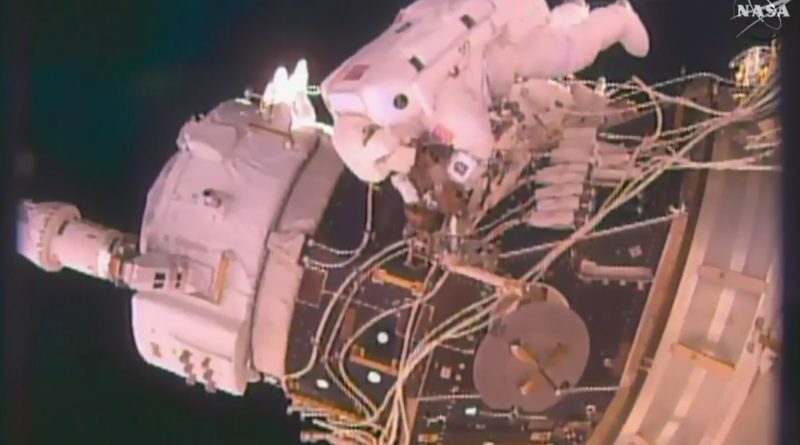 Kate Rubins, after her first EVA, has a career spacewalking time of five hours and 58 minutes. 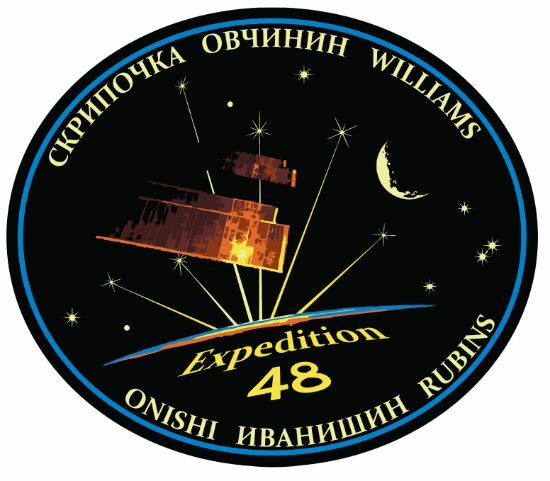 Williams and Rubins will get a chance to add more EVA time to their records on September 1 in a recently added spacewalk taking advantage of a slip in visiting vehicle schedules to complete some outstanding tasks on the exterior of the station. EVA-37 is dedicated to the retraction of the Trailing Thermal Control Radiator – an operation that failed in a spacewalk late last year. Also, the crew will install a high definition camera assembly and complete a series of minor tasks leftover from recent EVAs.